Local Website Archive offers an easy way to save information from the web to your hard disk. Local Website Archive can be used as WebSite-Watcher add-on or as stand alone program without WebSite-Watcher. Collect, find and reuse information! All orders are processed by our partner ShareIt. If you purchase via credit card you will receive your license within the next few minutes! How to obtain a written quote? Companies and educational organizations must register the Pro-Version, the Freeware-Version is for personal use only. Please read the Terms of License. With your order you agree with these terms. 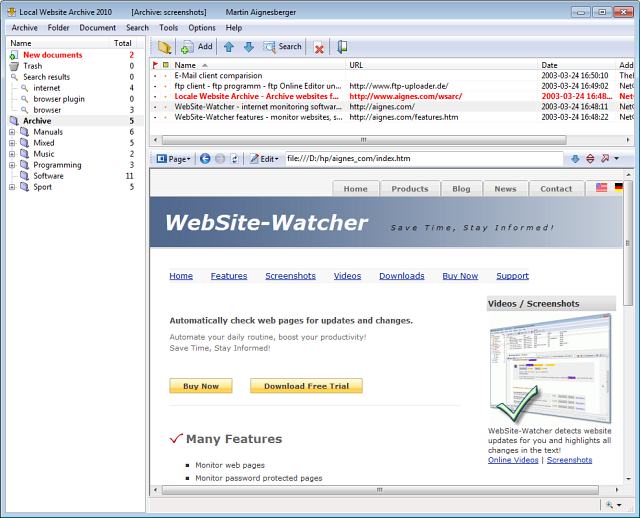 Main window with folder tree, document list and internal browser. Local Website Archive Lite has limited features and is freeware for personal use. Differences between the free Lite version and the Pro edition can be found in the comparison chart.